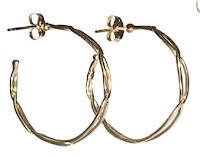 I've been looking for the right pair of gold hoop earrings for a few years. They will not be plain, young-lady tube hoops, or thin wires. I'd like a good weight (but not heavy) some texture or interest, in at least 18k. Price is always a consideration, so I may have to save for the right ones, but while a tiny corner of my savings account accumulates, I'll be patient. Ray Griffiths' open crown work crescent hoop earrings have an alluring Eastern flavour, but aren't costume-y; $1725 from Fragments. 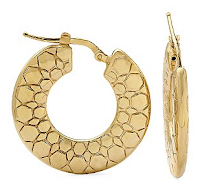 Gurhan's New Spring earrings mate hand-hammered cylindrical beads with small spherical beads, for refined, small hoops (about one inch), but the richness of the 24k gold will make them stand out from across a room. $760 from Twist. 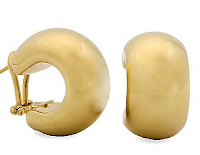 These Ross Simons 18k puff hoops are on sale for $446;the hanging length, 3/4" is the smallest size that I'm thinking of. Ah, woven hoops.Rather ladies-who-lunch, yet I can see them with a simple sweater and slacks. This pair by Roberto Coin hangs nearly one-inch; $700 from Ross Simons' web site. 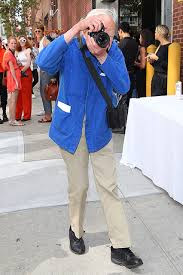 I'd want to wear my choice for many years, so am leaning toward classic-with-substance instead of offbeat. What I would once have rejected as too 'society' has new appeal now. 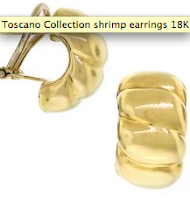 A girlfriend has a pair of these shrimp hoops, and they're charming on her.Toscano Collection 18k hoops channel my inner Italian socialite, $369 from Benbridge. Are they 'me'? Maybe I could test-drive hers first. 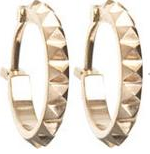 Andrea Lieberman 18k rose gold pyramid hoop earrings, tailored yet edgy, would be perfect except for the tiny (half-inch) drop. They are $550 from Barney's, and alas, not my hoops. But I wanted to show them in case a more petite reader is pining for a pair like this. 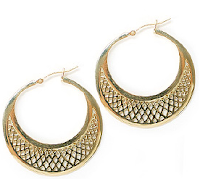 These 14k croc-print hoops (also from Ross Simons) are only $185 on sale, a terrific buy. I think they look very Bottega Veneta, and with a hanging length of just over an inch, they'd have presence. But I'm not sure the 14k would provide the rich gold gorgeousness I am hoping for. If only I could have them all before me to try on! I've been drawn to the "ladies who lunch" type of jewelry of late. I even think those massive clip-on earrings look great. I think you could bring an artistic flair to the genre, Duchesse. I love hoops and wear them most days, I have smaller and larger, and also square. Fortunately, my colouring works best with silver, so buying a pair is not such an investment! I've just recently started wearimg hoops or bigger hoops and love them. I am searching for the perfect pair but haven't found them yet. You have a lot of nice options here. My coloring works best with rose gold or silver/white gold, but I have to have gold posts so most silver earrings are out. Yellow gold has to be just right to look good. It does seem worthwihile to search for the right pair though. Imogen: White gold might be an option should you ever want a dressier look. I wore only white metals for decades, now wear both. Mardel: If you find the perfect pair please let us know where! Frugal: Lunch away! Your beloved thrift stores sometimes turn up great 'big' earrings. Hoops, in my opinion, look great on young women and maybe even on everyone else but me. I have worn earrings since the age of 12, and when now in this certain age, when everything seems to dropping, I find hoops s o depressing ! Instead, I love to wear diamonds, as large and bright as I can afford. They kind of hide the depressing facial lines. I now have a pair of amethyst earrings. This color+blackened diamonds +white gold just look so good together. Lucky you who can wear the flirting hoops! I see many women of colour, especially from the Caribbean, wearing hoops at all ages and looking great in them, but of course skin with more melanin tends to age better, though it could be cultural as well. Utterly gorgeous ladies from Haiti in my neighbourhood. Duchesse has a good not on proportions - if one can't wear BIG hoops, they should have a bit more heft and interest. I'm also silver not gold, so that doesn't make them terribly expensive - what is difficult is finding exactly the right ones. 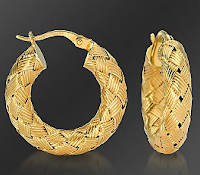 I'm strictly gold and I love hoops...and I adore Gurhan jewelry, though I can't afford it, really. I do have one piece and love the rich look of the 24 karat gold. Amazingly the piece is quite strong, which surprised me, as I thought it would be very soft. Apparently it's the way it's made that somehow gives it strength. Christine: 24k stands above, doesn't it? I have heard of a 'super hard' high karat gold, wonder if that is what he uses. Exquisite pieces, lucky you. Yes I am very lucky with my Gurhan piece. And that concludes my jewelry purchases for the rest of my life. Let's hope I never tire of it! Apparently, Gurhan hammers the pieces and rolls them a certain way and that's how they stay strong. I do have an article somewhere, which I can send (email) if you're interested. Anonymous/Christine: 'Work-hardening' is not usually achievable with 24k. so I am curious. Would appreciate the article if easily found. 'for the rest of my life' with tongue in cheek! 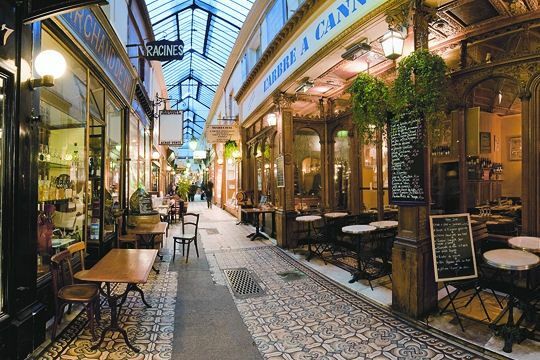 I'll be glad to find the article and send it Duchesse. And, yes, I had my tongue firmly in cheek when I said I hoped I didn't tire of it. 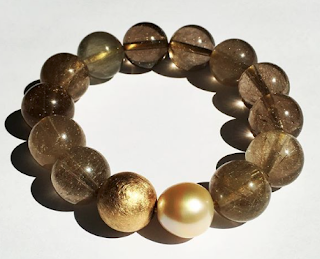 Gurhan is a major purchase and I saved for about two years for my bracelet. I could never have done that if I wasn't sure it was "the one" and that it was right for my style and life. My son wittily asked if I had given as much time and thought when considering marrying his father. I did point out that I was sure the bracelet would last as long as our 25 (and counting) years of marriage. Ack, some of my last post came out wrong. I can save, and have to all the time. I meant to say that this is a once in a lifetime purchase, like my wedding ring.